Richard Eyre’s splendid production for The Royal Opera has lavish period sets and costumes enhancing the reality of a moving story based on true life.and includes Placido Domingo. 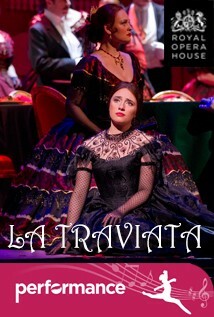 From the thrill of unexpected romance to a heartbreaking reconciliation that comes too late – Verdi’s 'La Traviata' is one of the most popular of all operas. Alfredo falls in love in with the courtesan Violetta in glamorous Paris society, but underneath the surface run darker undercurrents, leading to a tragic ending. The opera’s wealth of melodies includes the famous Brindisi and the exuberant ‘Sempre libera’ – both showing the lyricism of Italian opera at its most immediately appealing. Richard Eyre’s production for The Royal Opera brings out all the emotional colour, from the giddy discovery of love, through painful confrontation to the inevitable conclusion. Lavish period sets and costumes enhance the reality of a moving story based on true life. This will make an interesting comparison with new Met production earlier in December. The cast includes Ermonela Jaho (Violetta Valéry), Charles Castronovo (Alfredo Germont), Plácido Domingo (Giorgio Germont).